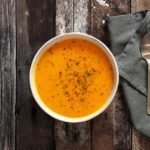 In this updated version of the old classic, we add new flavors and a whole lot of extra nutrition (that happen to be good for fighting off colds!) Kale’s benefits are probably no surprise, holding top spots on ‘superfood’ lists through the past decade. The benefits of celeriac and hazelnuts might be more newsworthy though. These banana nut muffins replace butter with peanut butter – making them delicious and healthier. Let me tell you why I love these healthy whole wheat, banana nut muffins… Because you can feel good about eating one for breakfast or an afternoon snack. A lot of muffin recipes are bakery-style sugar-bombs topped with sugar crumbs….